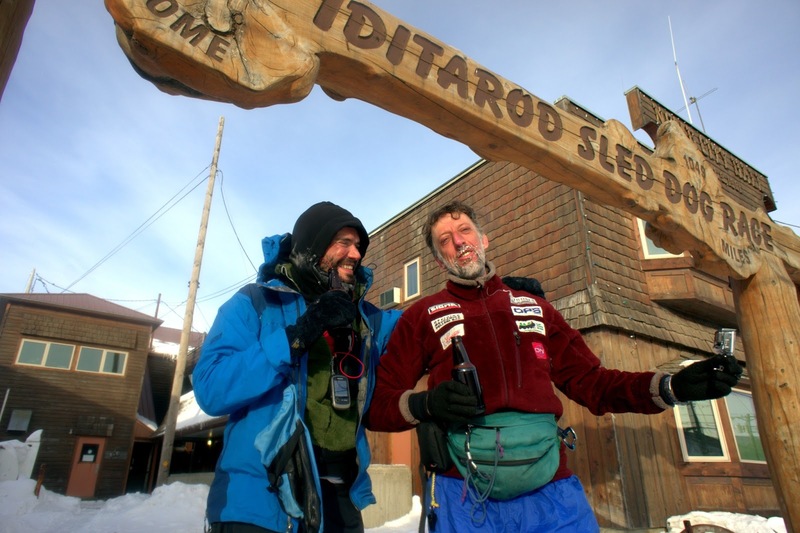 During Beat's final night on the Iditarod Trail, the temperature dropped into the minus thirties. 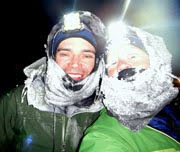 Beat and Marco left the Topkok cabin at 1 a.m. under a bright moon to make the final push through the wind-sharpened cold. 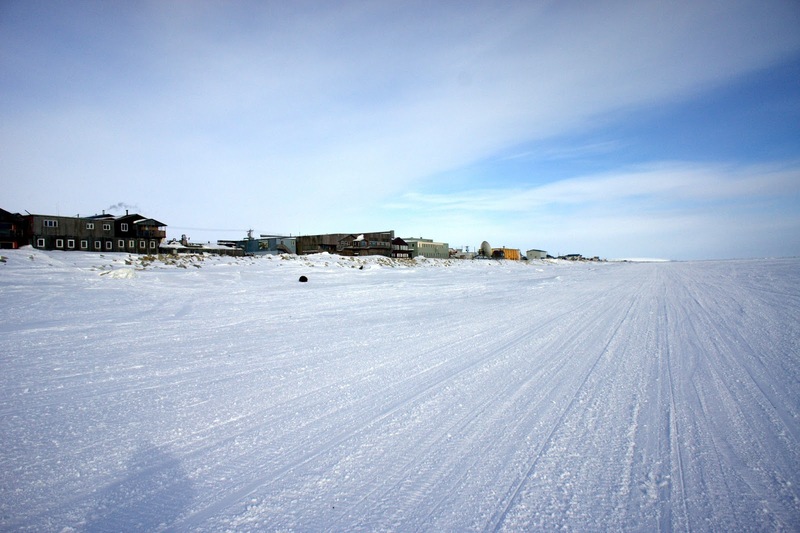 I received my final sat phone dispatch from Beat in the late morning, after he and Marco stopped near a ghost town called Safety. They planned a breakfast break there, and while seeking a lee from the wind near a locked cabin, managed to hunker down in a spot that was both in the shade and still brushed with wind. They attempted to hurry through the breakfast-making motions, but the urgent grip of the cold sank in first, until they had no choice but to pack up with numb fingers and keep moving as core heat painfully returned to their extremities. Beat's voice sounded ragged and rough on the phone. They were twenty miles out; but it still seemed so far. Back in Nome, Phil's 5-year-old daughter Hannah glanced out the window and announced that it was raining. "I don't think it's raining, honey," Phil replied. But as we opened the curtains, we saw a river of water gushing down the street. The stream was gathering in slushy eddies and freezing to the curbs in tiers of ice. 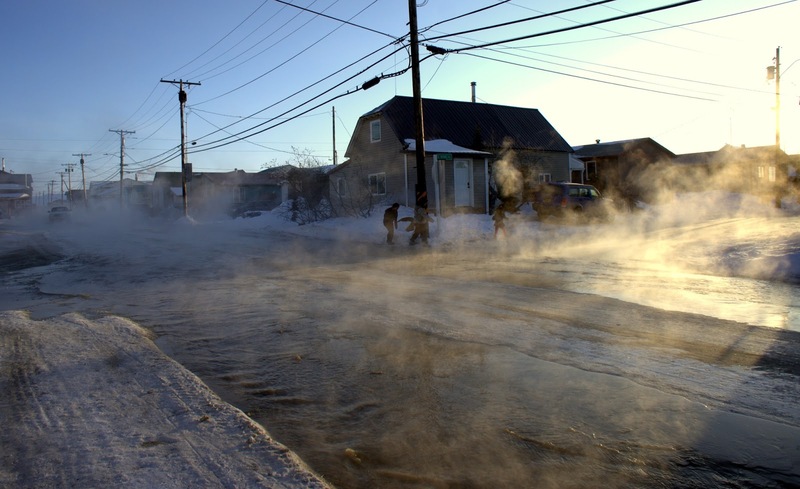 A water pipe had burst in the cold and flooded the street. Children were outside splashing through the flood like they were playing in puddles during a summer rainstorm. 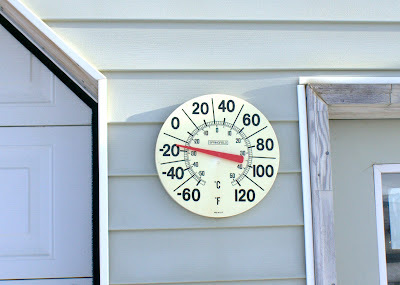 The temperature was still well into the minus twenties. The liquor store opened at 1 p.m., so I walked into town to buy Beat and Marco some celebratory beers. The sun warmed my cheeks and I was glad the temperature had risen so much, as I was planning to bike out to see them on the trail and was still nervous about my inadequate foot gear. On the way back to the house, I saw it was minus 17, at midday. 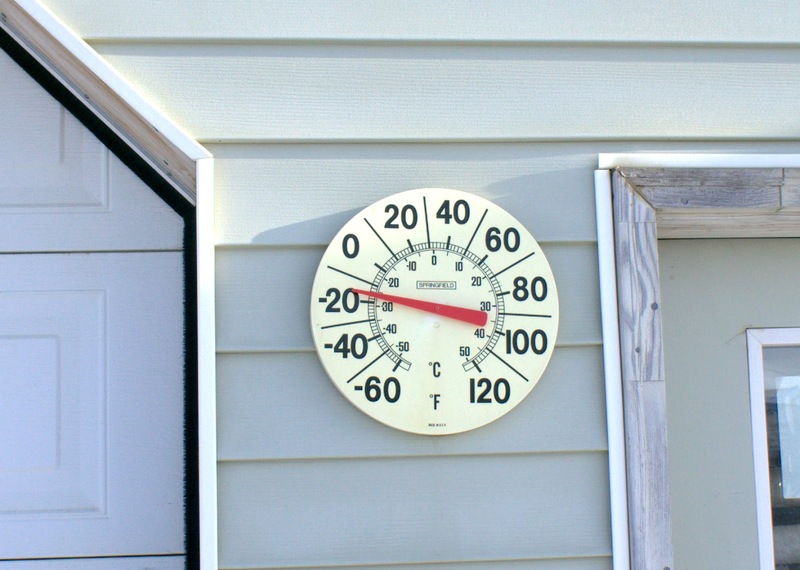 It probably wouldn't get much warmer. Self portrait from six miles out, lungs a bit raw from breathing the cold wind, after running for five minutes to warm up my toes. 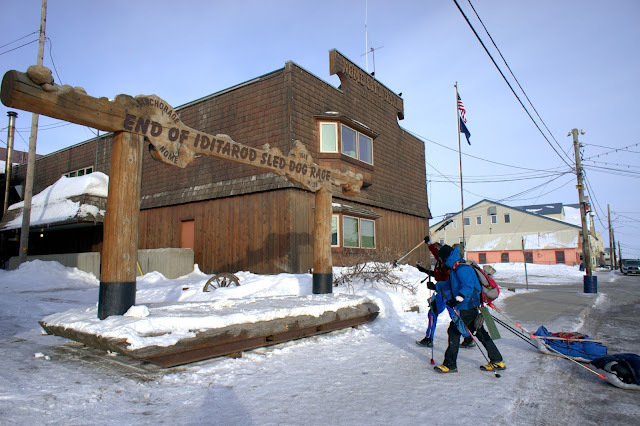 I can't say any of my Alaska activities, except perhaps for my daylong ride in subzero temperatures in the White Mountains, fully prepared me for the rigors of these simple rides I did while visiting Nome. I don't know exactly why they felt so hard. 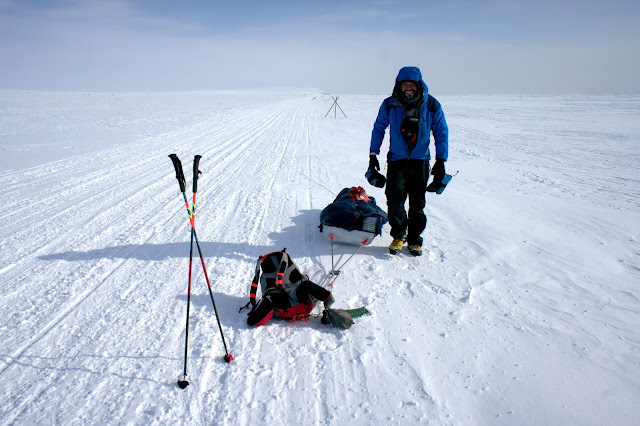 Maybe it was the lack of proper footgear, or a psychological reaction to the overwhelming expansiveness of the frozen landscape. Or maybe it was the knowledge that this "good" weather could turn on me at any minute and kick up a gale of ground blizzards, unmanageable winds, and potential whiteouts. If I got caught out with my minimal supplies I would quickly be in trouble, and this realization made every nibble from the cold feel that much sharper. I'm not sure I had a full understanding or respect for Beat's daily life on the trail beyond McGrath until I came here, and pedaled my own laughably minimal miles away from the safety net of Nome. The edge is no longer an abstract concept out here; it's visibly real. 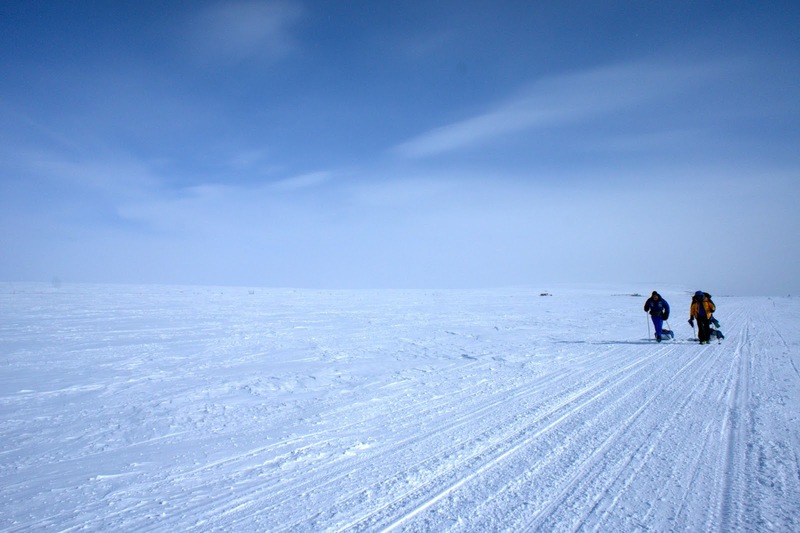 I was pedaling across the crystal blue ice of a slough when I first saw figures moving on the horizon. As they rounded the wide edge of Cape Nome, I quickened my pedal strokes up the hillside in time to meet them at the crest of the hill. This energy burst accompanied a blast of emotions — relief, pride, awe, happiness, and love. It was the first time I'd seem him in a month, and Beat looked rough — as Phil worded it, like he had been through something "real." His beard was thick and coarse, his nose was swollen and red, and his face was crusted with frost nip scabs. His shoes were nearly in pieces, and he'd fashioned dog booties to the tips of his trekking poles. His pants seemed to hang loosely off his waist even though he said he'd been eating "a ton," but he had a big smile on his face. I met Marco for the first time, too — tall, rail thin, with long legs and a fantastically big nose. "Ciao," we greeted each other with a kiss on the cold cheeks. It was a great moment. I intended to say hello and see you soon, and then leave, so as to not interfere with their race. But I decided it couldn't hurt to shadow them for a short while and listen to the dispatches, not unlike listening to Beat on his sat phone. He talked excitedly about his adventures and gear adjustments he was already making in his mind. 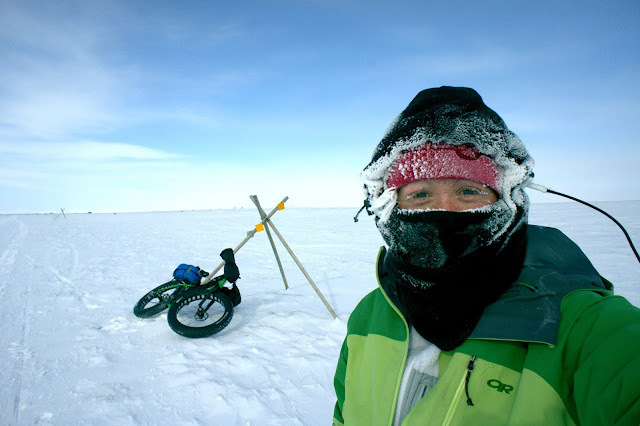 It was tough for me to break away — both because I was so happy to see him, and because walking was a more enjoyable activity for my chilled feet than pedaling. But Beat gently suggested that I was skirting that uncomfortable edge of support, so I bowed out. Of course I couldn't help but linger long enough to take a few pictures on the way out. Marco and Beat and the expanse. I pedaled back as quickly as I could muster so I'd have enough time to take a shower, prepare for their arrival, and set up a vigil at the arch on Front Street. 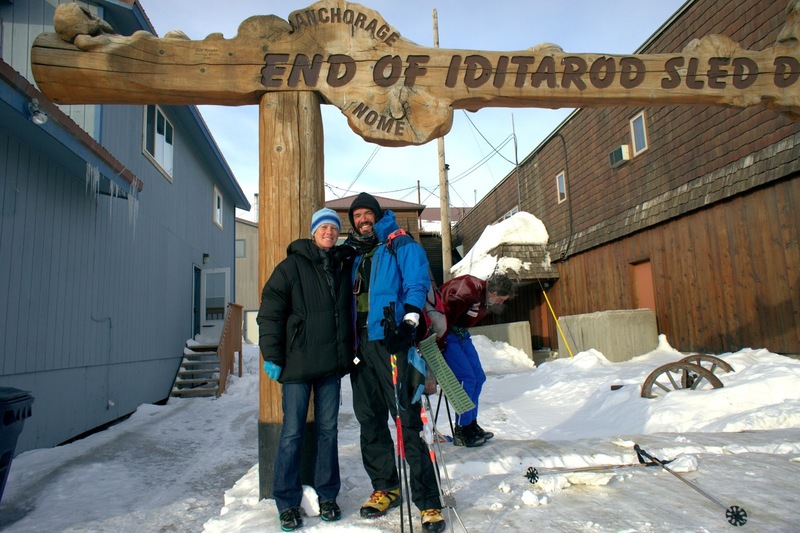 This is what Beat and Marco arrived to as they walked the final miles on the shoreline trail — a tiny cluster of buildings lining a frozen sea. Just before 7 p.m., they made their appearance on Front Street. 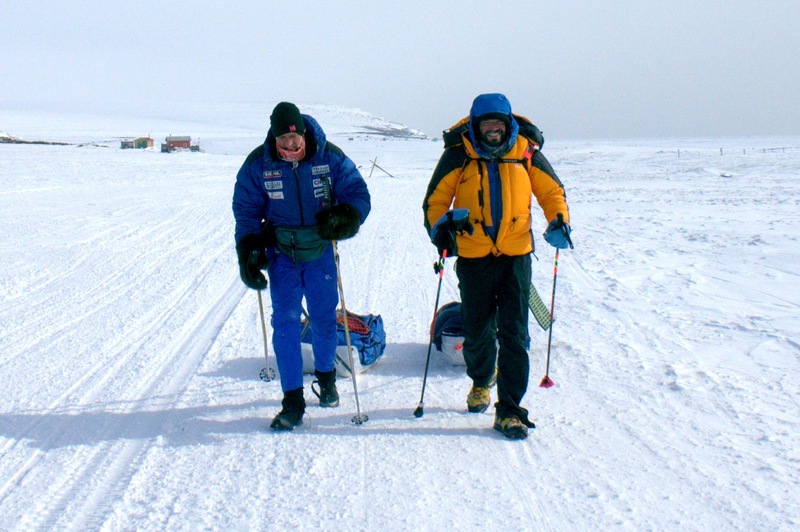 A few scattered bystanders gave passing glances to the two ice-encrusted guys dragging their sleds on the pavement. 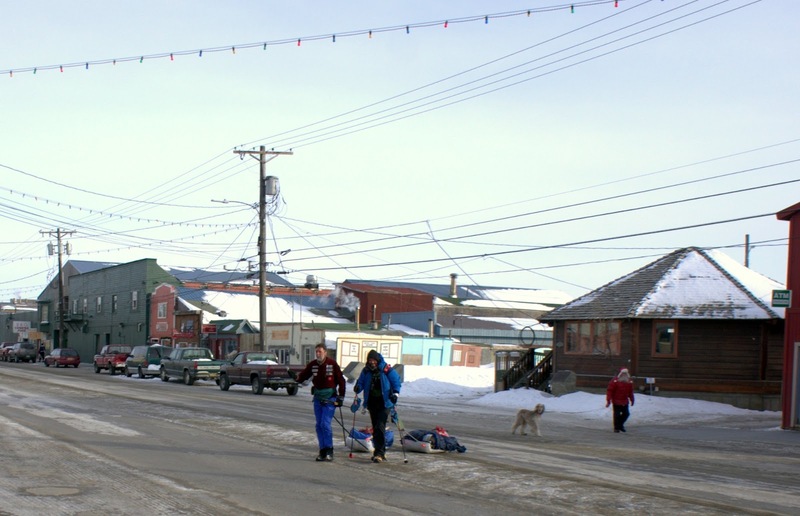 I also think it says much about the general atmosphere of Nome that the random bystander in this photo is a bearded guy wearing a Santa hat and a red puffy coat, walking what appears to be an Irish Wolfhound type of dog. The victorious final approach to the burled arch. 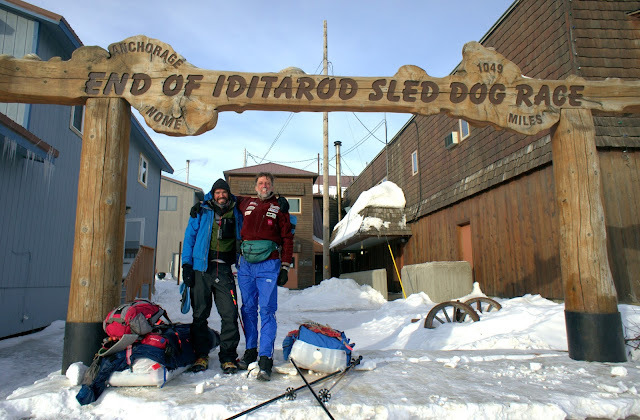 Beat and Marco hoisted their sleds and stepped up there together at 7 p.m. on the dot, Sunday, March 24. 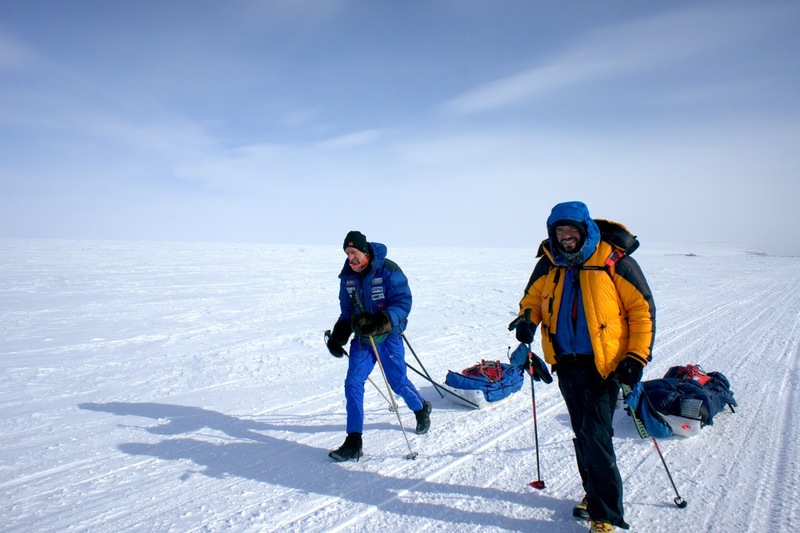 A full 28 days, and a round calendar month, had passed since they launched from Knik Lake on the cloudy afternoon of February 24. To a few people who stopped on the street to congratulate them, they were "the guys who walked from Anchorage." I couldn't resist a posed shot with Beat and the arch. I pulled a couple of Alaskan Ambers out of the cavernous pockets of my down coat, and the two toasted a grand adventure and partnership. I can only imagine the satisfaction of that moment, drinking in was is truly an incredible accomplishment. But it apparently only lasted for a moment for Beat; he's already talking about next year. Congrats again to Beat! He's incredible! I'm in awe. Well bloody done to them both. So he IS thinking about next year, huh? I was wondering what the "gear adjustments" would be for. He must really have fallen for Alaska. I'm looking forward to reading Beat's story, and please keep us posted on his recovery. How long does it take to feel back to normal (at least physically) after something like that? Alaskan Amber -- my favorite beer, a fitting end to a great adventure. Well,done! This feat is so unbelievable, I can't even wrap my head around it. Beat and Shawn, 2 people I know personally, go beyond the imagination of impossible. Way to concur, whatever is that they set out to! Congrats to Beat and Marco! Really awesome. Words fail me! This is truly an amazing accomplishment! Next time I am slogging through something tough for me (though terribly minor in comparison) I will think about what Beat accomplished as an inspiration to just keep going. A picture says thousands words,at first these pictures left me speachless. Then I re-read "...gently suggested...skirting the uncomfortable edge of support." 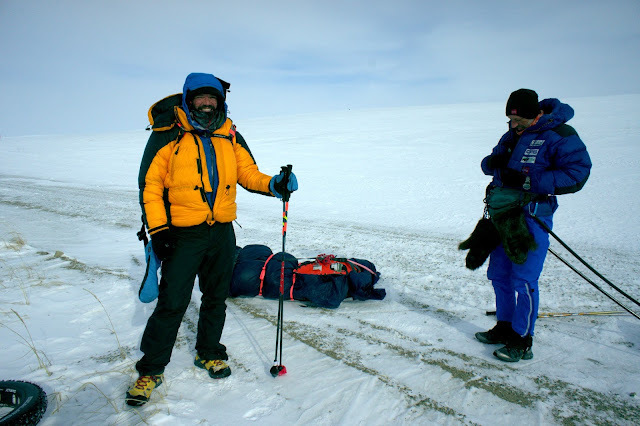 A small hint of what this trek was like deep inside Beat. Thanks Beat and you too, Jill. I pale in the shadows.